Entering 2005, there was cause for debate in choosing the top running back prospect in the country. Reggie Bush eventually ran away with the title, but with he and several other notable backs moving on to the NFL, the debate stands no longer. Oklahoma's Adrian Peterson is the class of the position heading into the 2006 season, although there are numerous other backs who should enjoy monstrous efforts this fall. Perhaps most intriguing about the future is the versatility of today's backs. For every back with the prototypical size for the position, the flexibility of the collegiate game is creating the opportunity for star backs to come in all shapes and sizes. Big backs are back en vogue with Louisville's Michael Bush and Rutgers' Brian Leonard leading the pack. Smaller backs continue to post incredible numbers. West Virginia's Steve Slaton, Michigan's Mike Hart and Northern Illinois' Garrett Wolfe, for example, appear poised to compete for conference rushing titles. Adrian Peterson will claim his status as the nation's top collegiate running back with Reggie Bush off to the NFL. There are some who feel Peterson would have been the top back in the country in 2006 even if Bush had remained with the Trojans for his senior season. Peterson signed with Oklahoma as an elite prep talent, and it didn't take him long to live up to the hype. 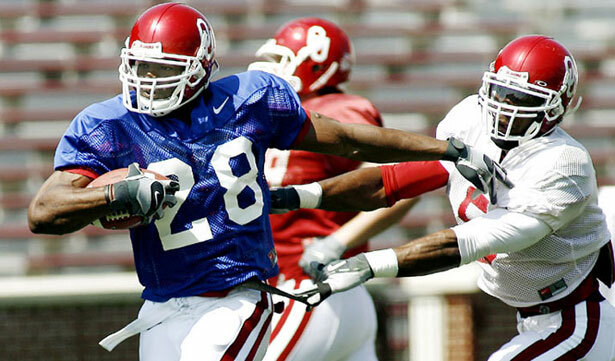 As a true freshman, Peterson finished with an OU-record 1,925 rushing yards despite starting just eight games. He finished second in the Heisman voting as a true freshman, the highest any freshman has ever ranked in the Heisman polling. Unfortunately, Peterson was hampered by an ineffective passing offense and injuries in 2005. With quarterback Jason White graduating, the Sooners were led into battle by Rhett Bomar, and opposing defenses were able to crowd the line of scrimmage. That slowed Peterson considerably, and a nagging ankle sprain was even more bothersome. The injury caused Peterson to miss all or more than half of four games in 2005. He still led all Big 12 backs with 1,024 yards and once again earned consensus All-Big 12 honors. He possesses a spectacular combination of size, speed, strength and is a natural, fluid runner who can change directions easily. Bush is an incredible combination of size, speed and pure athleticism. A monstrous running back with the agility to earn comparisons to great backs who happen to be big such as Jerome Bettis and to a lesser extent T.J. Duckett, rather than big guys who play running back like Brandon Jacobs. He has the power as an interior runner that one would expect for a back of his size, but shows remarkable agility and breakaway speed for such a big man. He was named First-Team All Big East after setting the school record for rushing touchdowns with 23 and points scored with 144. He scored two or more touchdowns in nine consecutive games, and led the nation in scoring during the regular season with an average of 16.00 ppg in 2005. Not only did he lead the Big East in rushing, but in all-purpose yardage as well thanks to shockingly soft hands (48 receptions over his career, 640 yards, 2 touchdowns). A very versatile athlete, Bush spent his senior season in high school playing quarterback after seeing action at running back, wide receiver, defensive back, linebacker and defensive end over his career. When Auburn lost Ronnie Brown and Carnell "Cadillac" Williams to the NFL last year, opposing SEC teams must have shared a collective sigh of relief. However, Irons stepped into the void and earned First-Team all-SEC honors. A transfer from South Carolina, Irons averaged 5.05 yards per carry while rushing for 1,293 yards and 13 touchdowns. In his first year as the starter, Irons simply led the SEC with an average of 109.5 rushing yards per game during the regular season. He also paced the conference with 117.6 yards per game (941 total) in SEC games. NFL scouts are also intrigued with Irons. He will only have two real seasons of strain on his body, having rushed only 66 times during his initial two seasons with South Carolina before. More important, Irons has good quickness and agility in the open field. Perhaps not surprisingly considering his surname, Irons also plays with power and proved to be a tough, durable runner in 2005. A two-time first-team conference selection, Leonard is still underrated because he is technically a fullback. He has the frame to play fullback at the next level, but has too much athleticism and versatility in the running and receiving departments to be limited to the traditional lead-blocking fullback position. Rutgers head coach Greg Schiano long ago recognized Leonard's unique talents and certainly does not limit him to the traditional fullback position. A Doak Walker Award candidate in 2004 and 2005, Leonard's 2,306 rushing yards in three seasons is already good for sixth on Rutgers' all-time list. The two-time All-Big East Conference selection has 230 career points, second all-time on the Rutgers' scoring list. He finished last season tied for second in the Big East in receptions per game (4.45), fifth in the Conference in all-purpose yards (105.8 per game) and scoring (8.2 points per game), and seventh in rushing. Leonard isn't the bullish interior runner Mike Alstott was, but is a similar versatile athlete who would be misused if just asked to block. Leonard might be the best running back that most D-I college football fans haven't seen yet. Lynch might be the nation's most explosive big-play artist after first exploding onto the scene as a true freshman backup behind J.J. Arrington. While Arrington was busy racking up a 2,000-yard season in 2004, Lynch finished with 628 yards on only 71 carries (8.8-yard average) while only occasionally filling in. Lynch's average was bound to fall as his attempts rose in 2005. It further suffered when he was hampered by a finger injury that made holding on to the football difficult. As the injury healed, however, Lynch's numbers increased. By the end of the season he rushed for 1,246 yards and 10 touchdowns. Despite the slow start, Lynch's average remained a gaudy 6.4 yards per carry. He also appeared to get stronger as the season wore on, finishing with more than 100 yards in six of his final eight games, including a 194-yard, three-touchdown effort against BYU in the Las Vegas Bowl. The junior has great quickness and can accelerate past defenders in this wide open offense. Booker finished 2005 as the team's leading rusher, but was actually more effective in 2004. Last season, Booker led the team in rushing yards (550), rushing touchdowns (4) and had the longest run from scrimmage (58). In 2004, he and Leon Washington combined to form an awesome 1-2 punch that accumulated 1,838 rushing yards and 11 touchdowns. Of those totals, Booker produced 887 yards and four touchdowns. Booker has obvious talent, but hasn't yet shown the toughness and physicality needed to become a feature back at the collegiate level, much less the NFL. He has the height to add mass and strength and could enjoy a breakout season now that Washington is off to the NFL. Booker's strength is his elusiveness in the open field. He also has the speed to turn any play into a big one. He is a naturally gifted player who could enjoy a breakout 2006 season if quarterback Drew Weatherford is able to keep defenses from loading the box to stop him. The most dominant runner in D-I football over the past two seasons, Wolfe remains relatively unknown because of the attention heaped on Reggie Bush and Peterson. He won the "Triple Crown" of the MAC Conference as a sophomore in 2004, winning the rushing yardage (1,656), scoring (21 touchdowns), and all-purpose yardage (2004) races. Wolfe was on pace for even bigger numbers this past season before a knee sprain knocked him out of three games. He finished with 1,580 rushing yards and 16 touchdowns, and had more 200-yard rushing games (three) than games held to under 100 (two) while healthy. Wolfe obviously lacks the prototypical size for the next level, but has legitimate quickness and speed. He missed three games in 2005, which is all the evidence some need to classify him as too small to hold up as a feature back. Regardless, Wolfe has averaged 249 rushing attempts over the past two seasons. Some will also question Wolfe's level of competition, but he rushed for a combined 393 yards and four touchdowns against two Big Ten opponents (Michigan, Northwestern) last year. The reigning Big East Rookie of the Year, Slaton began the season buried on the WVU depth chart before emerging to have a breakout year. Despite not starting a game until October, Slaton finished the season with 1,128 rushing yards and 19 touchdowns, including a captivating 204-yard, three-touchdown performance against Georgia in the Sugar Bowl. Slaton's toughest task might be holding onto the starting job with a great deal of talent behind him. However, Rich Rodriguez's offense is perfectly suited for Slaton, whose vision, agility and breakaway ability make him an incredibly slippery target for defenses attempting to shut down the West Virginia offense. Walker is a young, productive back who used his deceptive speed to the outside to become the first Irish back to rush for more than 100 yards in the first four games of a season. Walker finished with 1,196 rushing yards and nine rushing touchdowns as the Irish's go-to runner in 2005. He also chipped in 43 receptions for 351 yards and another two scores. Walker entered the 2005 season as the Irish's leading rusher, having produced 786 yards and seven touchdowns as a true freshman. Still, some questioned his explosiveness and consistency, as he had only two games of 100 or more yards in 2004. Walker increased that to seven last season. Walker is a talented runner NFL scouts will be looking at, but he lacks the timed speed to be a consistent breakaway threat. He gets himself in trouble when he out-runs blocks and loses patience diving into the line of scrimmage before the holes reveal themselves. However, Walker is extremely versatile and is being utilized well in this offense, as the passing game opens opportunities for the running game instead of the other way around. The reigning Big Ten Freshman of the Year and a Freshman All-American, Sutton rushed for 1,474 yards and scored 18 touchdowns. The true freshman running back ranked among the nation's top 10 in rushing and scoring last season, setting school freshman records with 126.4 rushing yards and 9.8 points per game during the regular season. Despite several other backs gaining more attention in the Big Ten, Sutton actually led the conference with 1,390 yards on the ground during the regular season, averaging 6.0 yards per carry with 18 total touchdowns. Northwestern's wide open passing attack has led to many runners posting gaudy statistics. In fact, Northwestern has featured a 1,000-yard rusher in nine of the past 11 seasons. With Sutton only entering his sophomore season, scouts are more intrigued with his speed and quickness than most Northwestern backs of recent years. Sutton signed on with the Wildcats as one of the most highly-touted prep runners in the country, leaving the state of Ohio as its all-time leading prep rusher. Jamaal Charles, Texas, 6-1, 190, So: Earned Big 12 Offensive Freshman of the Year honors despite splitting time in a loaded Texas backfield. Led the conference with 7.4 yards per carry. Mike Hart, Michigan, 5-09, 195, JR: Enjoyed a monstrous true freshman season when he rushed for a conference-best 1,455 yards and nine touchdowns and earned First-Team Big Ten honors. Struggled with injuries throughout the 2005 season, limiting him to 662 yards and four touchdowns. Talented, but will be competing with sophomore Kevin Grady for playing time in 2006. Gary Russell, Minnesota, 5-11, 195, JR: Backed up Laurence Maroney in 2005 and still finished with 1,130 rushing yards. Has great agility and speed, but surprises with his interior power as well. Even with Maroney, Russell was Minnesota's preferred option in goal-line situations. Finished with 18 rushing touchdowns to Maroney's 10. Darren McFadden, Arkansas, 6-2, 210, So: Became the first Razorback and only the seventh running back in SEC history to rush for more than 1,000 yards as a true freshman. Finished with 1,113 yards and 11 touchdowns. Lynell Hamilton, San Diego State, 6-1, 220, JR: The 2003 Mountain West Conference Freshman of the Year, Hamilton returned to form in 2005 after missing the 2004 season with a severely broken ankle. Struggled with a nagging hamstring injury throughout much of 2005, but healed as the season went on and rushed for more than 100 yards in his final three contests. The most talented and productive Aztecs runner since Marshall Faulk. Jonathan Stewart, Oregon, 5-11, 228, So: Signed with Oregon as the nation's second-rated prospect. Only had 53 rushing attempts as a freshman behind since departed Terrence Whitehead, but led the team with six touchdowns, including a 97-yard kickoff return against rival Oregon State. Rob Rang is a Senior Analyst for NFLDraftScout.com, which is distributed by The Sports Xchange.